What is the sunniest place in Europe? It’s that time of the year where we’re thinking about where we might like to go on our summer holidays, or for those than are super-organised, already looking forward to the one they booked months ago. For many people, the vital ingredient in a summer holiday is guaranteed sunshine. The UK’s weather is notoriously changeable, so where should you go if sunny days are a must? This graph – mapped byMetric Maps based on information gathered by NASA – shows where the sunniest spots are. 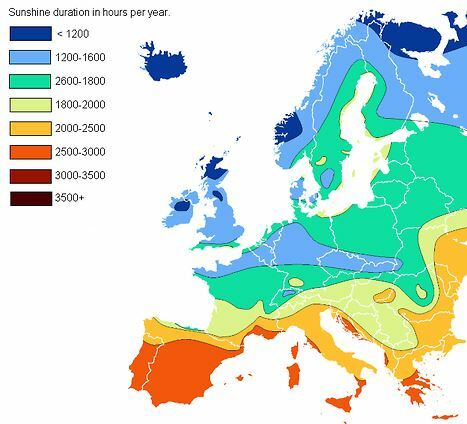 As you can see, we poor souls in the UK are struggling for sunshine (just 1200-1600 hours a year, an average of between 3.3 and 4.3 hours a day), and it’s even worse for those of us in the far north of Scotland (fewer than 1200 hours a year, 3.3 hours a day). But just look at Southern Europe! Most of Spain and Portugal, Southern Italy, Sardinia, Southern Greece, the South of France and coastal Croatia are basking in between 2500 and 3000 hours of sunshine every year – an average of up to 8.2 hours a day, and even more in the summer! In sunny Spain, it’s Seville that takes the crown as the sunniest spot of all – so much so that it’s been given the nickname “frying pan of Europe”, getting a little under 3000 hours of sunshine every year, around 12 glorious hours every day in June, July and August. Better get booking your holiday in Spain! If you want to turn your stay in Spain into something a little more permanent, you may be interested to read our guide to moving to Spain. If you are looking to send money to Spain, or wanting to turn a vacation into a staycation, don’t forget to check out our Spanish currency exchange service.